Soil plays a vital role in supporting the growth of crops and other vegetation, maintaining the environment, and acting as source and sink for atmospheric gases. Soils are natural bodies on which plants grow. The increasing population, industrialization, and changing lifestyle have negative effect on soil and are responsible for soil pollution. Good soil and climate for more crop production are valuable things for any nation. 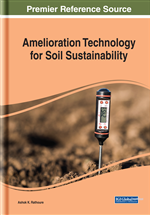 Soil amendments can be used to cost-effectively reduce the bio-availability and mobility of toxic metals in contaminated soils. Organic amendments considerably affect nutrient balance and interaction mobility of nutrients by influencing the chemical, physical, and biological environment in soils. Here in this chapter, the author has discussed the soil, its profile and type, analysis, and benefits on rock phosphate amendments. Soil profile can be studied vertically through the soil area. It is normally regarded as a plane at right angles to the surface. In practice, a description of a soil profile comprises soil properties that can be determined only by examining volumes of soil. A description of a pedon is normally based on examination of a profile, and the properties of the pedon are expected from the properties of the profile. The width of a profile ranges from a few decimeters to several meters or more. It shall be adequate to include the largest structural units. A soil horizon is a parallel layer to the soil surface which can be distinguished by the adjacent layers through a characteristic set of properties, which is produced by the processes of soil formation. Soil texture act as an important part in management of nutrients because it impacts retention of nutrient, for example, soils with fine texture tend to have greater ability to store soil nutrients. The simplest method of determining the type of soil is by simply feeling it to determine texture and predicting about primary makeup of the soil is. To perform the task, a baseball size portion of the soil is grabbed in hands and wetted with water, while working the moist soil with hands. The stickier it is, the more clay there is. The soapier the soil feels, the higher the silt content. Grittiness is representative of sand. Particle size distribution has an important impact on permeability of soil or water intake rate, water storage capacity ability to aggregate, crushing and the chemical makeup of the soil. The value of land, land use capability and soil management practices are largely determined by the texture. Salinity and alkalinity in soil happens in arid and semi-arid regions, where precipitation is inadequate to meet evapo-transpiration needs of plants, and the salts move up to the surface. Salt affected soils are present inside irrigated lands. Salt accumulation happens through irrigation water and over-irrigation. The salt content in soil is measured in terms of electrical conductivity.